SCAMS! Less-than-truthful labels abound! How can you tell which kind of eggs are the best for a healthy body? Cage-Free: All this means is that birds are not confined to cages; as in “free-range,” they can each roam around in their 1.5 feet of space! Pasture-Raised: There are no standards for pasture-raised chickens…carton labels may say this and it means nothing! Omega-3: Farmers will add flax seed for the last two weeks before cartons are filled with eggs. Supposedly this raises Omega-3 content. Omega-3s are essential fatty acids. The main types of Omega 3s are ALA (plant oil) which is a worthless fat and DHA and EPA (marine oils) which are much more beneficial to your body. Certified Organic: Hens are not caged and required to have outdoor access. They must be fed 100% organic all-vegetarian diet made from crops grown without pesticides or fertilizers. (Annual third-party audits verify that these farmers are in compliance). Animal Welfare Approved: This is a free program which certifies farmers who raise their animals on pasture. Chickens must be able to move freely and dust-bathe, spread their wings and forage. Which eggs are best to eat? If you can start buying eggs locally, that is the best way to go. 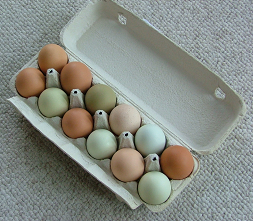 Check out your town’s farmers’ market or from local farmers who may offer their fresh eggs for sale. Go with farmers you trust to tell you the truth about how they raise their chickens. Perhaps you can’t get farm fresh eggs, and that’s okay too. Even store bought eggs are a better choice than bagels, or other high-sugar content foods. There are dozens of label scams: Click this link to identify all the “fake” healthy food in your kitchen and automatically “REPAIR” your broken metabolism while forcing your body to burn more stubborn belly fat. For more great Videos such as this one on Eggs or others on Fat Loss, Motivation and Tips, be sure to check out our YouTube Channel and become a subscriber!